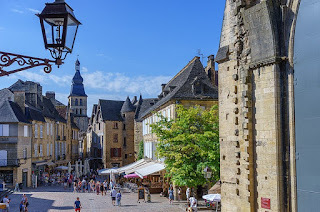 Despite having muddled through for the past seven-hundred years of letter deliveries and liaisons without the regiment of named streets and numbered addresses, the medieval French town of Sarlat-la-Canéda in Dordogne is finally bowing to pressures from telecommunication providers, who demand that municipal authorities adopt formal street names and put up signage for its pristine fourteenth century old town. The ten thousand residents of Sarlat, a contender for inscription on UNESCO’s rolls, are rushing to find fitting namesakes for a surveyed two-hundred nineteen avenues and alleyways by the end of May in order to have fibre-optic cables installed. Here is an alternative proposal for a system of geolocators, or rather INSEE (Institut national de la statistique et des études économiques) code, that the request and reform reminded me of. Local guests—the town being the backdrop for a number of historic cinematic protrayals—and national heroes are among the nominees.